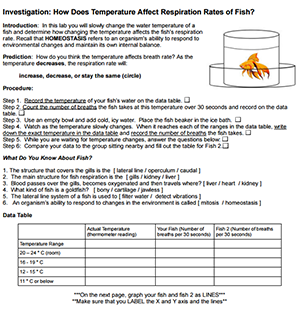 Investigation: How Does Temperature Affect Respiration? This lab is focused on fish and the metabolism of ectothermic (warm-blooded) animals. The investigation also be useful for beginning students in reinforcing good lab procedures and graphing. I’m always surprised by how many students have difficulty reading thermometers and setting up a water bath. This lab has been redesigned to make it simple and quick. The original investigation also had warm water adjustments, but I found those to be stressful for the fish and students had a hard time warming the water without getting it too hot for the fish. Going from room temperature to cold water using ice does not cause the fish harm. Feeder goldfish can be purchased from pet stores, they are usually about 15 cents a piece, which makes it cheap to buy enough for multiple classes. You can re-use the fish if you give them a day to recover. A fish tank can be set up in the class, and fish can even be offered to students to take home at the end of the year. Goldfish are cold water, community fish, tanks do not need a heater, but a filter is recommended, especially if you plan to keep the fish for a while. The lab contains extension questions that may be difficult for students to complete on their own, I usually discuss this with the class as a group after the lab is completed. You can also save paper by not printing this page and just placing it on an overhead for discussion. Shannon – ectothermic means cold-blooded. endothermic means warm-blooded. you might want to fix that! otherwise, a good activity that i’ve used in my zoology classes for 15 years! Oops, I’ll fix that right away. I almost left those terms out, mainly because I’m trying to phase out the use of cold and warm-blooded. Thanks for the headsup!